If The Lost Boys is the greasy, sloppy Rolling Stones of ’80s vampire movies, then Fright Night is the slick, poppy Beatles. (Extending the metaphor, that would make Near Dark The Kinks and The Hunger, well, still David Bowie). Stripped to its bare elements, Fright Night is a modern retelling of the classic Dracula tale as an ageless vamp crosses oceans of time for a girl that resembles an old flame. 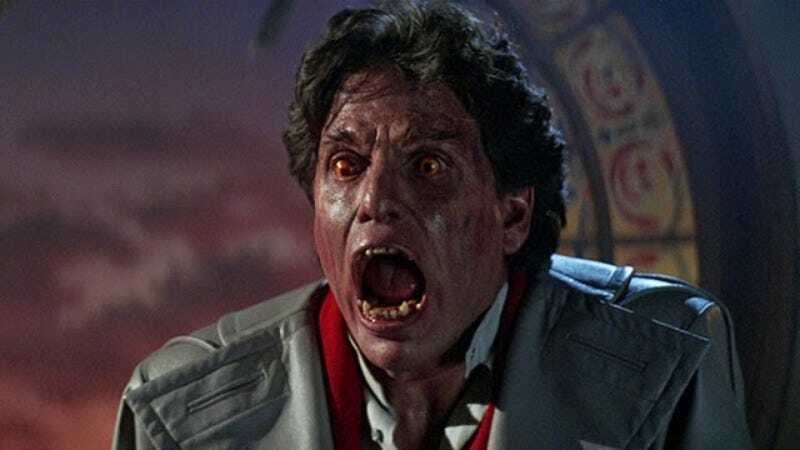 Fright Night perfectly rides the line between horror and comedy, and features special effects deemed too frightening for Ghostbusters (Richard Edlund was involved with the creature effects on both films). Not even a disappointing sequel or a lackluster remake could tarnish the reputation of the original, which was recently released on a 30th Anniversary Blu-ray by Twilight Time. Now Cult Screenings UK Ltd, in conjunction with Dead Mouse Productions, has a Kickstarter campaign to fund their new documentary, You’re So Cool, Brewster! The Story Of Fright Night. The doc will be hosted by “Peter Vincent”—not an undead Roddy McDowell, but rather actor Simon Bamford in pretty convincing makeup. Tom Holland, the director of the original film, is involved as producer and creative consultant, and allowed the filmmakers access to his personal archive of behind-the-scenes footage. The team behind The Story Of Fright Night previously produced Leviathan: The Story Of Hellraiser And Hellbound: Hellraiser II. The Kickstarter features many donation levels ranging from $30 (which gets you a T-shirt) to $3,811.38, which will get backers a co-executive producer credit (and a T-shirt). The campaign has a goal of $15,203 with 29 days left to go. Click here to donate to Fright Night…for real.